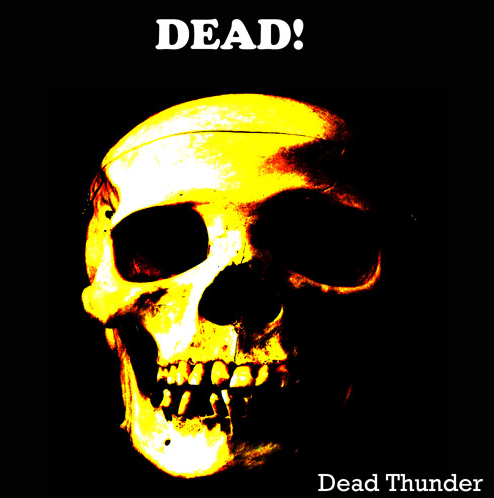 Following up on our review of Dead Thunder's Broken English EP from a couple of weeks ago, we're now checking out the band's DEAD! EP, also from 2012. Why? Well, I really like what I heard with the first one, and I'd like to get this crew some more exposure, in the hopes that they'll have the chance to put together some more music to play at high volume and enjoy further. That explained, let's get into it! Running four tracks and recorded from live improvisation, DEAD! again finds the brothers of DT turning out solid jammy riffs, bursts of lively tangentialism, twisted bridges, and gnarly tone-play from the guitar to match the drummer's rhythm juggling. The instrumental focus allows them to keep revving harder and weirder without having to drop back into the calm of a chorus, but they do give enough time with the riffs to instigate some serious body-swaying and/or head-banging, no small trick for stuff done on the fly. And, as on the other EP, Dead Thunder get across a clear sense of character and humor with the songs, from the low-note wallows to the tears across extensive shredding and smashing. Quite a talented duo, and well worth your time to check out over on their SoundCloud page, particularly as it won't cost you anything but time. Here's hoping they make some more music materialize in the near future!